I got this mower a few years back from my friend, Rob, when he was moving. At the time, it worked pretty well, running on two 12V, 17AH sealed lead-acid batteries. 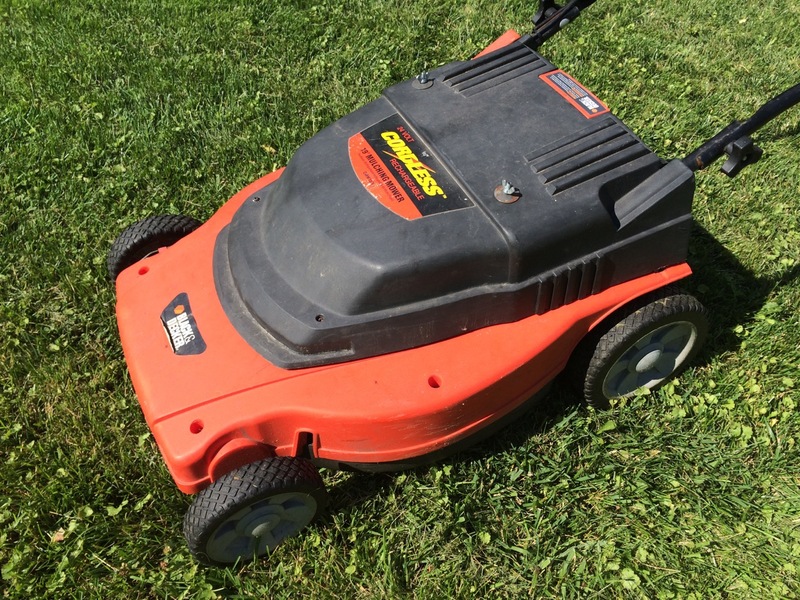 The batteries have slowly been losing capacity, and the mower noticeably bogs down when pushing too fast or going through extra long grass. I checked the batteries. At the point where I could really feel the mower slowing, I stopped and checked the voltage. It was at 12.5V per battery, which should be fine, but seeing as how the voltage drops under load, it was time to replace them. I already had four Nissan Leaf cell modules around. I bought them because I was able to get a good deal – they were the last four modules from a group buy that a friend of a friend did. I had really gotten them for use in an electric mini-bike, but I really needed to mow my lawn right now a lot more than I needed to zip around the yard on a cycle. The first step was to remove the old batteries. Those were surrounded by a hunk of foam, which I pulled out, and then by a strap, which held the batteries in place. I removed the screws holding down the strap. Next, I removed the two screws holding the power wires to the battery terminals. After that, I could simply push the wires out of the way, and take out the batteries. 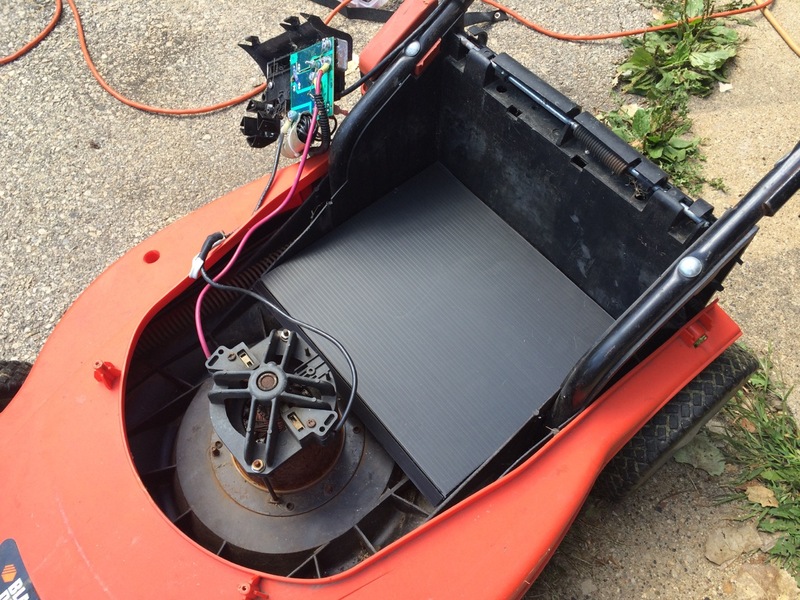 Next, I set a Leaf cell module in the mower. Holy Cow! I couldn’t believe how good the fit was! 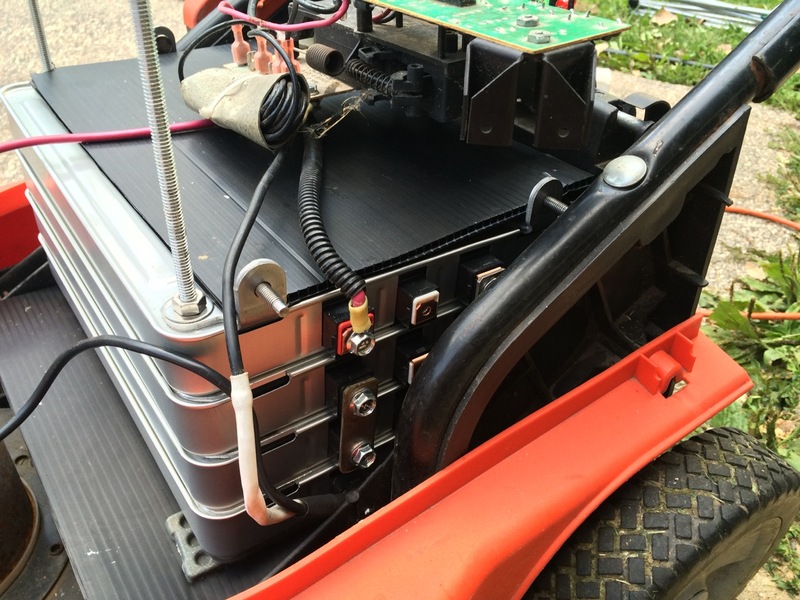 The mower’s battery bay is nearly a foot wide – just enough for the Leaf batteries to run crosswise with enough room for the terminals on the end. The whole bottom of the mower is plastic. While there’s plenty of structure there to hold the batteries, it’s not exactly flat or even. I cut a piece of corrugated plastic to fit the bottom of the mower. That also covered up a hole worn through the bottom of the mower, which could let cut grass in to the battery compartment. I also notched the two corners of the coroplast so that I would be able to get threaded rod down into the corners of the mower to mount down the batteries. Nissan Leaf cell modules are rectangular aluminum cans with four lithium pouch cell inside, two in series, two in parallel. The cans stack on top of each other, just like tuna cans in a cupboard. In each corner is a hole and the cans are held together with rods through the corners, then tightened down to compress the modules to each other. I looked through my pile of project materials and found four pieces of scrap 1/4-20 threaded rod and some matching nuts and washers. One thing that I DIDN’T have was a full set of spacers. The Leaf modules are not completely flat. In the Leaf electric car there is a pair of 1/8th” thick steel spacers between each pair of modules. It helps line them up, and there are holes in the spacers for the threaded rod as well. 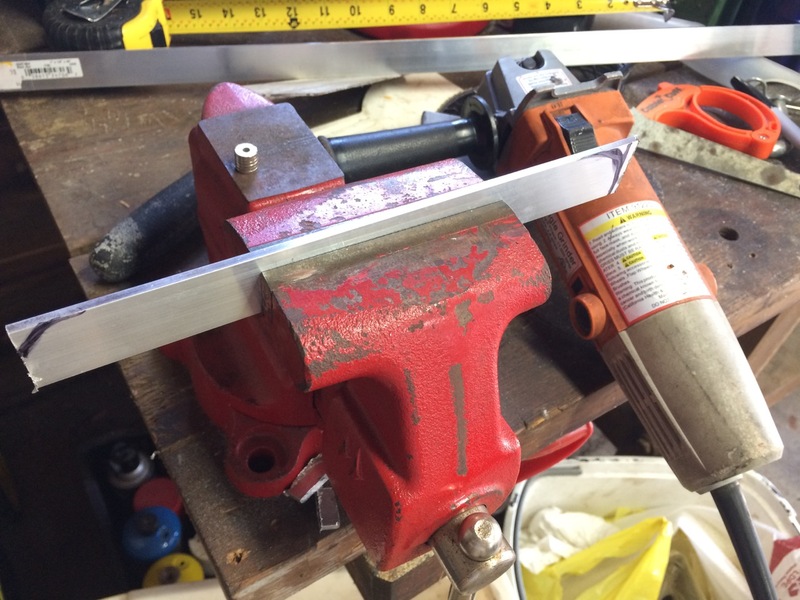 I DID have some spare 1/8″ angle aluminum. After cutting and grinding one of those to make a pair of flat spacers, I ended up going to the hardware store to grab some actual flat stock, which ended up being much easier to work with. To mark the holes in the spacers, I just set them on a cell module and stuck a marker right through the hole. After that, I drilled a hole in the aluminum with a 1/4″ drill bit. With all four modules stacked up, with spacers between them, I ran the 1/4-20 threaded rod through, and put nuts and washers on both ends. Since the cells were now physically bolted together, I could add the bus bars. I had a few kicking around, but they were too long. 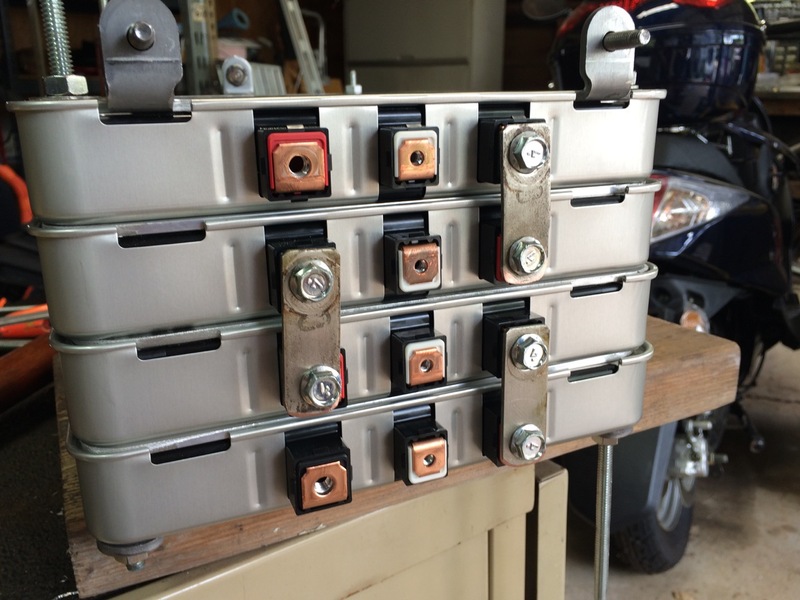 (I believe these were from the salvaged Mitsubishi iMiEV battery pack.) I put a bus bar into my vise, cut off the extra length with the angle-grinder, and drilled a new 1/4″ hole. After testing to make sure the new bus bar was right, I made two more of them the same way, then put them on the battery pack and hand-tightened them down. Tightening screws into battery terminals is one place where you don’t want to use an impact wrench! 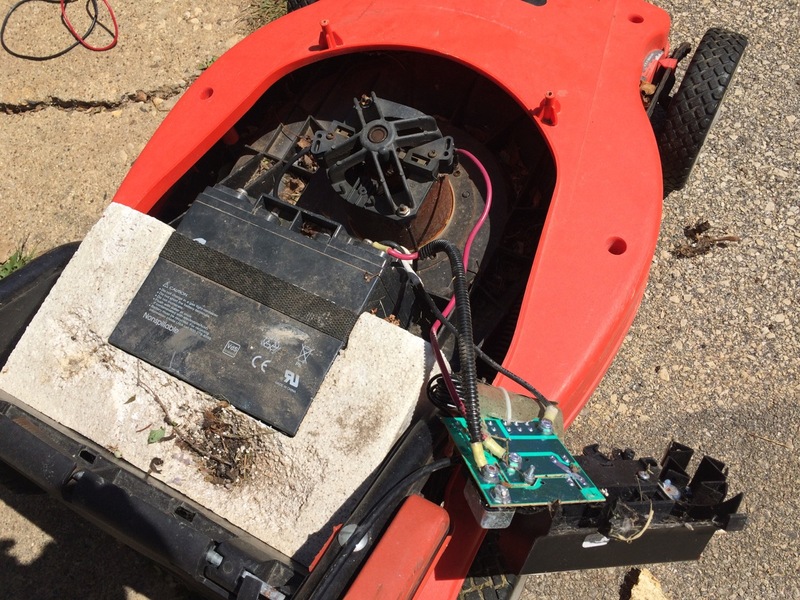 Next, I lifted the battery pack into the mower, and marked where the two threaded rods on the rear side of the mower would line up. 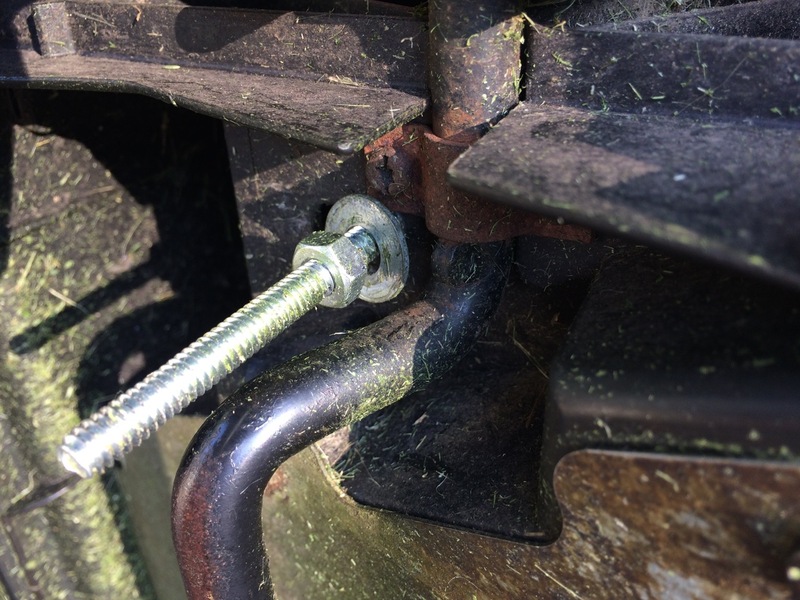 I drilled holes in those locations, so that the threaded rod would poke through the bottom of the mower to be bolted into place. I also weighed the battery pack, as I had my new battery pack, the original battery pack, and my bathroom garage scale handy. The original battery (2x17AH 12V) weighed in at about 33 lbs. The new battery weighed 38 lbs. 5 pounds heavier! Yipes! I thought lithium was supposed to be lighter! Well, it is for the same capacity. The Nissan Leaf cell modules are rated at 60A, and I needed at least 3 of them to get to the appropriate 24V range of the mower. I had four, so I figured that would give me around 30V and higher capacity. The trade off is that the mower gained a few pounds. I had to make the electrical connection BEFORE fully inserting the battery, as I wouldn’t have easy access to the bottom negative terminal once the battery was fully in. Also, the existing wires were a little short, so it was a bit of wrestling to get all the wires to reach, but I was able to do with with no other modification other than drilling out the ring terminals slightly to fit the larger screws used on the new cells. Once connected, I lowered the battery the rest of the way in, making sure the threaded rods ran through the bottom. At that point, I flipped the mower up on the side and put on washers, lock washers, and nuts. I realized that the extra threaded rod was longer than my deep sockets, and had to trim down the rod by a few inches. The cut off disc on my angle grinder made quick work of it. I tightened down the nuts on the threaded rod and could feel the battery pack pull down into the mower. With the mower on its side, I also used a “flapper disc” to touch up the blade. 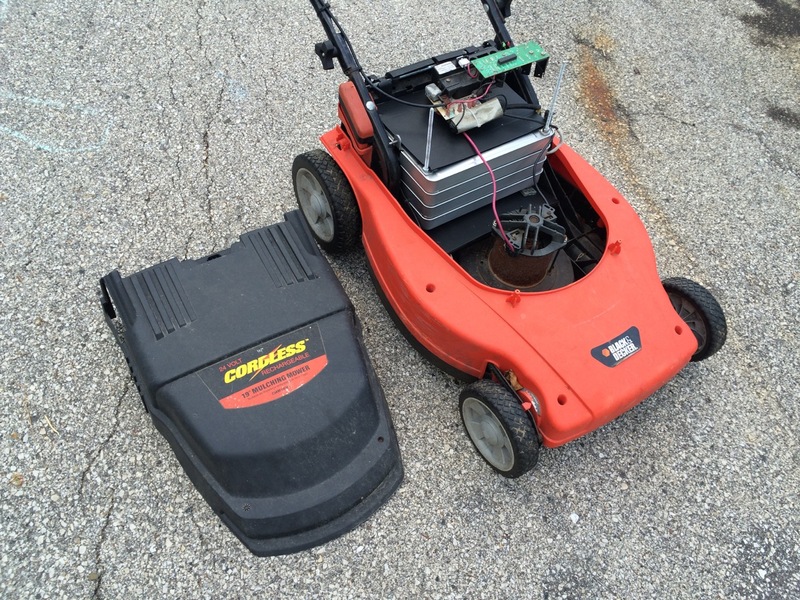 A sharp mower doesn’t just cut better, it’s also more efficient and draws less current than the battery. With the mower together, I took it was a test run. Wow! 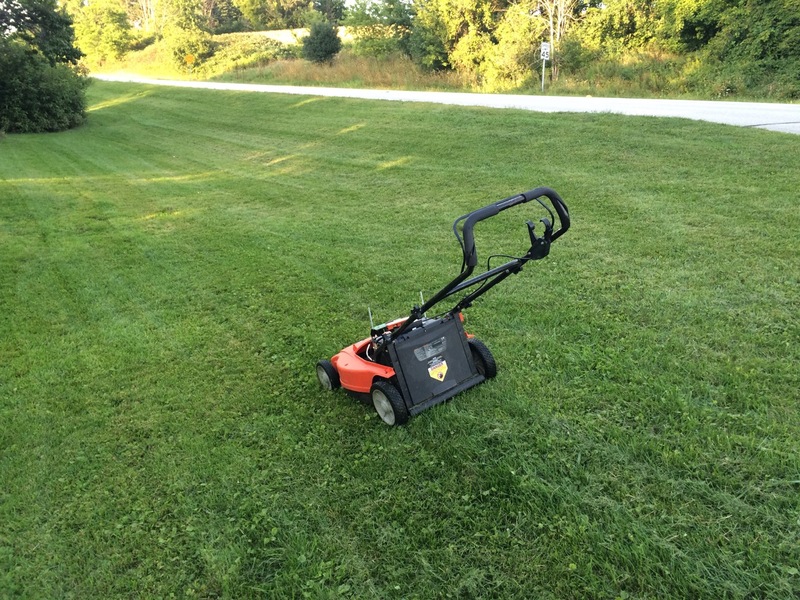 When I fired it up, I could instantly tell that the mower spun faster. The new battery pack was about 6 volts higher. On DC motors, speed is generally proportional to voltage. Higher Voltage means Higher Speed. The mower cut great! A faster spinning blade cut better. It did weigh a LITTLE bit more, which wasn’t so bad, as I figure it’s just good exercise. I checked the battery voltage before and after cutting my entire side yard. it was just below 31V when I started and a little below 30V when I finished. That’s a lot of mowing for only a 1 volt drop! Looking at the cover I have for the mower, I realized that I might actually be able to fit the cover back on, pretty much unmodified! I set the cover in place, but it couldn’t go down all the way because of the extra threaded rod sticking up. With the cover in placed, I smacked the cover with a rubber mallet so that the threaded rod would indent on the plastic. I then pulled the cover off and drilled two 1/4″ holes through it. I placed the cover back on, slid it all the way down, and fastened it in place with a pair of fender washers and wing nuts. The cover was originally held in place with a number of odd screws. I never liked those. They were hard to line up and had a non-standard head. Two wing nuts makes replacing the cover much easier. Now with the cover in place, I mowed my entire front yard. Overall, the mower works great! I will likely make a few more modifications still. I don’t have a dedicated charging system yet. The original charger is based on a 26V AC adapter. I need higher voltage than that for a full charge on the new battery pack. I have both a bench power supply and a “Cell Pro 6” charger which I could charge with, but I’ll want some sort of a quick-release adapter. I’d also like to have a digital volt meter right on the mower. Perhaps I can order a small, inexpensive panel meter, cut a hole right in the cover, and mount it there. 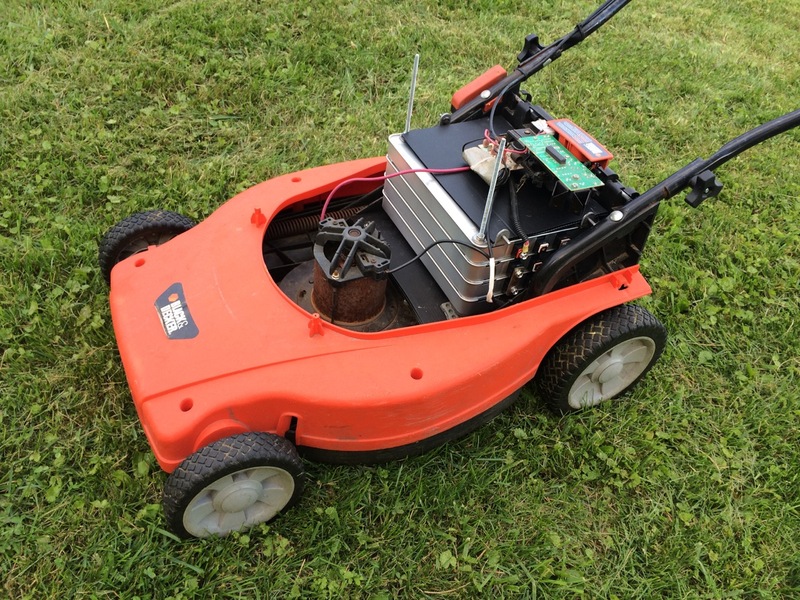 There’s also some potential for DIRECT solar charging of this mower. That’s it for now. I gotta get back to mowing the rest of the lawn. PS: What’s the battery capacity? The original was 2 x 12V x 17AH or 408 watt-hours. The new modules are rated at 500 watt-hours each, or 2,000 wh total. The new battery is nearly 5 times the capacity of the original. Come to think of it, if this mower were instead a motorcycle, it would have about a 20 mile range. PPS: Out of pocket cost for this project was about ten bucks for some aluminum from the hardware store. While I wouldn’t necessarily encourage people to spend several hundred dollars on lithium batteries to upgrade mowers, this was built almost entirely with materials I already had on hand! Use what ya got! Ha! I did something similar with my Black and Decker mower which was exactly like yours except instead of leaf modules I used what I had, a pair of Turnigy 6 cell 22.2 volt 5 amp hour lithium hobby batteries in parallel. They’re good for about 10 minutes of mowing and the whole thing is so light it’s more like vacuuming. I recharge off a large, solar charged deep cycle battery. I like your leaf modules idea. That would give me some range!